Fleas are a tremendous nuisance to our beloved pooch. These nasty bloodsuckers cause pain and irritation for your dog, as well as carry the risk of further infections or health complications. No dog owner likes to see their furry friend suffering from a flea infestation; so it is important that you know which product to choose to help rid your companion of this parasitic menace. With so many varieties of flea shampoo on the market, it can be difficult to know which is the best option for you. In this article, we discuss the best flea shampoos for dogs to help you bring quick relief to your pet. Is Flea Shampoo Safe For All Dogs? Can You Use Flea Shampoo On Puppies? Dogs which become infested with fleas usually have caught them from contact with other animals, be it other pets, wild or feral animals. It is also possible for your dog to pick up fleas from the surrounding environment itself. Fleas have very strong legs which enable them to leap extremely long distances from the ground to host, or from one animal to another. Once a flea has landed upon its victim, the flea will begin to feed almost immediately. They bite into the skin, releasing a chemical in their saliva which causes irritation and itching. In extreme cases, your dog may suffer a hypersensitive allergic reaction to this chemical, causing hair loss, inflammation, and even skin infection as they chew and scratch at themselves in frustration. There are several signs to look out for when flea bites on a dog are suspected. The trouble is, once a flea has found its way onto a suitable host, it is not going to leave. They are a type of “permanent eco parasite”, which means that they will stay upon your dog until they die or are somehow dislodged. They must feed at regular intervals to remain alive and fertile for breeding. There are many different types of flea shampoo on the market, but most of them will work in one of two ways: by using insecticides or by having a repellent effect. Particularly effective flea shampoos will use insecticides called “pyrethrins”. These are a kind of “adulticide”, which means that they target and kill the adult fleas which are residing upon your dog. These pyrethrins are the most common and widely used insecticides in flea shampoos and flea products on the market. They have been used as an insecticide for over a century. Pyrethrins are derived from chrysanthemum plants, which grow across Europe, Japan, the Middle East and in Kenya. They kill adult fleas by disrupting their nervous system. Usually, adulticides will be used in combination with an “insect growth regulator”. A common type of insect growth regulator is “methoprene”. These interfere with the eggs of the fleas, causing them to become unviable and prevent them from hatching into larvae. The term insect growth regulator refers to the way these chemicals intervene with the growth and life cycle of insects. They effectively make it impossible for a flea to complete its life cycle through egg, larvae, pupae and through to maturity. Methoprene is considered a form of biochemical pesticide, because it doesn’t poison pests directly like pyrethrins, rather it simply prevents them from reaching maturity and continuing their life cycle. Therefore, insect growth regulators must be used at the right stage of the pests growth cycle to have the most beneficial effect. It is only poisonous to the eggs and larvae, once a flea has reached pupal stage or become an adult flea it will cease to have an impact. It is for this reason they are best used in combination with an adulticide. Non-insecticidal flea shampoos work by having a repellent effect. There are many which are chemical free, instead using herbal extracts and essential oils which fleas do not like. This prevents fleas from latching onto your dog and being brought into your home. These natural options are generally more gentle and suitable for younger animals or those with a skin sensitivity. Many flea shampoos can solve the issue of fleas effectively while keeping your dog clean. But some of the stronger formulations can result in dry, scaly skin or irritation. Pet Diesel Shampoo and Conditioner helps to defend against this by providing hydration balance which comforts and soothes your dogs’ skin. Pet Diesel Shampoo and Conditioner is 100% organic. It uses natural oils of lavender, eucalyptus, rosemary, peppermint and aloe vera. Organic shea butter is also included due to its softening effects. After using this shampoo, your dogs’ coat will be smooth, shiny and smell amazing. Their skin will be soft and dandruff free, without irritation. The essential oils will work to effectively protect your pooch against fleas. Pet Diesel pride themselves upon their use of only organic ingredients which are safe for dogs with sensitive skin. A further bonus of this product is that it is also environmentally friendly. Gold Medal Pets Shampoo For Dogs uses what they refer to as a “Cardoplex system”. This is a special combination of vitamins, fruit acids and proteins designed to help your dogs’ fur dry faster. It also uses Pro-Vitamin B5 to bring thickness and shine to the coat. Gold Medal Pets Shampoo For Dogs uses the insecticide pyrethrins to tackle fleas. This effectively kills adult fleas which are living upon your dog, giving them relief from irritation. Wahl Dog/Puppy shampoo uses mint, rosemary and cedar oil to repel fleas. It does not use any toxic chemicals or pesticides in its formulation. All the ingredients are naturally derived. The use of these natural oils can effectively repel fleas for up to 7 days. This makes this shampoo a great choice for those who would rather not use chemical products upon their dog. Wahl Dog/Puppy Shampoo will make your dogs’ coat shiny, refreshed and clean. There are no detergents or harsh ingredients which haven’t been approved for human use. Honeydew Natural Pet Shampoo for Dogs & Puppies is a great choice for those with sensitive skin. It is a completely natural formulation which is free from parabens, sulfates, mineral oils and other harsh chemicals. Because it is so gentle, it is suitable for regular use for dogs which suffer irritation from other shampoos. It uses a combination of lemongrass and citronella to repel fleas with a fresh citrus scent. Even though it is effective at repelling fleas, it will not cause any dryness of the skin. This shampoo is incredibly gentle and suitable for both dogs and puppies. Lillian Ruff Flea and Tick Shampoo is designed to cleanse your dog's coat, while protecting against pesky fleas. It can be used throughout the year to prevent fleas from coming back. It uses natural essential oils which are known to deter fleas, such as peppermint, lavender, thyme, lemongrass, wintergreen, citronella, and eucalyptus. The formula is non-toxic and free from parabens, dyes, sulfates. It is also vegan-friendly. Because fleas can leave your dogs’ skin feeling irritated and sore, this shampoo includes soothing extracts of aloe vera and rosemary to calm the skin. Rosemary has antiseptic properties, while aloe vera is a fantastic anti-inflammatory and moisturizer. The use of oils like lavender leaves their coat smelling wonderful. Many people assume that flea shampoos are all the same and therefore, are safe to use on all kinds of dog. This is unfortunately not true, especially when considering an insecticidal formula. If you own one of these breeds, it is best to have a chat with your vet first about a gentle choice of flea treatment. Furthermore, very small breeds such as chihuahuas and other “toy dogs” may require a specialized shampoo due to their small body mass. There are dedicated shampoos for these breeds which can be purchased from your vet or pet stores. If you have a dog which is elderly, has broken skin, is unwell or on medication, it is good practice to check with your vet before using chemical shampoos. There is a risk that these may negatively interact with the medication, or put stress upon their immune system. Lastly, do not use flea shampoos upon pregnant or nursing dogs. The chemicals or essential oils could cause problems with her puppies so is best avoided. If the mother dog is at risk of fleas, speak to your vet. Young puppies exposed to flea infestations can become seriously ill or die from anemia. Puppies are especially vulnerable to the menace of fleas. When they are very young, a serious flea infestation can cause anemia which is very dangerous. Anemia is caused by a reduction in red blood cells. Because puppies are so small, they do not have much blood volume. If they are infested with fleas which feed multiple times per day, they can rapidly reach an anemic state. As frightening as this sounds, it is very important to treat puppies for fleas in the correct way. Using flea shampoos designed for adult dogs can be extremely toxic to puppies, putting them at more risk of health complications and death. If you have young puppies which you suspect have fleas, talk to your vet right away. Puppies under 8 weeks old can be safely treated with flea combs and flea baths which use baby shampoo to make sudsy water. Submerge the puppy into warm soapy water up to their neck and let the fur soak. Fleas should drown in the water, while the ones which climb up to their head can be picked off and squished. It is important to rinse the puppy and keep them warm during and after the bath. They should not become chilled. This process will remove the fleas currently present upon the puppy, but will not eliminate the flea problem altogether. There will be more fleas in the home which will find their way back onto your puppy after a short time. Older puppies can safely use special puppy flea shampoos. These will have either no chemicals or be a gentle formulation which is specially designed for use on young dogs. It is very important to use flea shampoo effectively if you want to ensure that fleas have been eradicated. 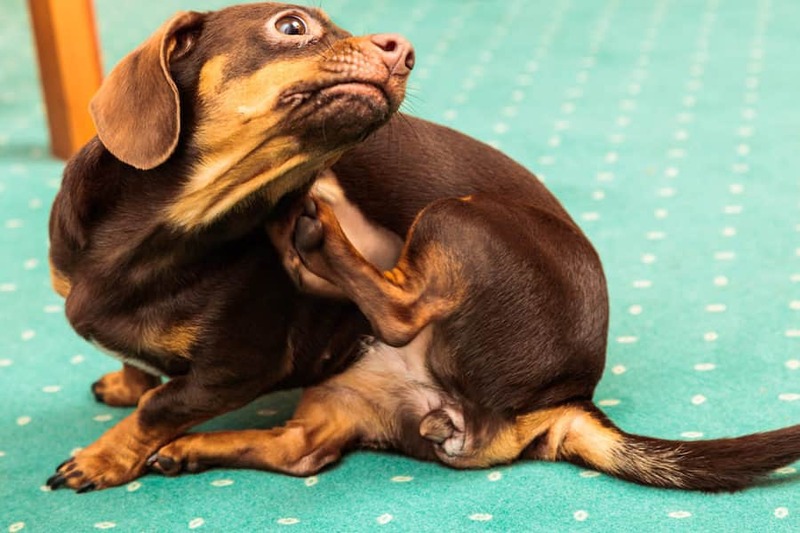 On many occasions, well-meaning owners have used flea shampoo in the wrong way, being shocked or surprised to find fleas on their pooch shortly afterward. This is usually because they have been applying the shampoo and washing their dog using an incorrect method. Of course, it is also critical to understand that flea shampoos will only treat your dog and not your home. You will have to de-flea your home too if you wish to eradicate fleas completely. Start by filling a bucket or bowl with warm soapy water. It is best to do this outdoors if possible. Pour the water over your dog to wet all the fur, make sure to be careful not to get any in their eyes or ears. Take the flea shampoo and start to lather it into their head, neck, and chest first. This is because fleas tend to move “uphill” so you want to catch them as they travel. Keep lathering all the way along the body down to the very tip of the tail. Once you have lathered the top section of your dog, you can start to move down their side, under the belly and armpits, throat and down the legs. Keep scrubbing gently but firmly, making sure you are working the lather right down into the skin. Use a flea comb to distribute the lather across the body. Rinse your dog thoroughly and go over them with the flea comb again. Keep sudsy hot water handy to wash the comb regularly. Give your dog lots of fuss for being such a good boy or girl! As we have seen, there is a wide variety of different flea shampoos available on the market today. However, before you purchase and use any of these products, it is incredibly important that you examine the labels and speak to your veterinarian. This is because there are some products out there which can pose a danger to you and your dog. If you choose to make a homemade flea shampoo, be sure to carefully check any ingredient you add to it. The Center For Public Integrity published the results of its “Perils of the New Pesticides” study in the year 2008. They found that more than 1600 deaths of pets had occurred due to exposure to chemicals in flea products. Risk levels are assigned to all forms of pesticide, detailing their potential dangers to humans. It has been found that flea products which contain chemicals such as permethrins do have the potential to be carcinogenic to humans. Flea products which commonly use the pesticide pyrethroid, especially in topical “spot-on” treatments have accounted for over 50% of the serious pesticide reactions in pets which were reported over the five years prior to the study. These serious reactions referred to incidents of brain damage, seizures, and heart attacks. On the other hand - flea treatments which did not use this chemical made up only around 6% of the incidents reported. 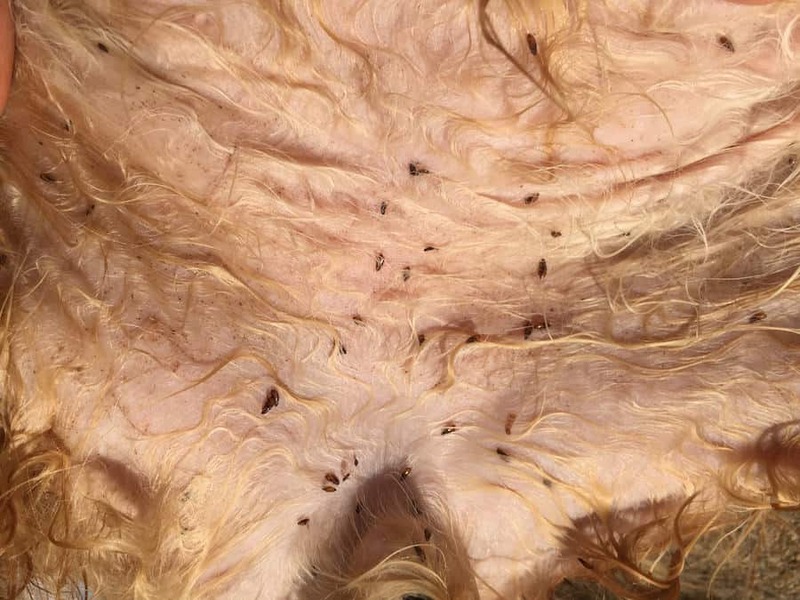 The Centre For Public Integrity stated that their study found pyrethrin-based flea treatments were approved for sale by the Environmental Protection Agency (EPA). They are available in numerous forms - including shampoos. However, the fact that they have been linked to poisonings is certainly concerning. In the year 2000, the Natural Resources Defence Council released a report which was called Poisons on Pets: Health Hazards from Flea and Tick Products. This report further demonstrated that there was a direct link between serious health issues in humans and pets, and the use of the chemicals commonly found in flea products. In addition to products which contain pyrethroids, there are other ingredients to keep an eye out for. Organophosphate insecticides (OPs) and carbamates are chemicals which are found in some flea products. Currently, the only organophosphate insecticide which is used in US flea products is “tetrachlorvinphos”. The EPA classes this chemical as “likely to be carcinogenic” to humans. If you can see an ingredient called “carbaryl” or “propoxur” - this means that this product contains a chemical known as a “carbamate”. These are believed to pose a risk to children and animals. The EPA considers propoxur to be a “probable human carcinogen”. Products which contain carbaryl are no longer permitted to be used in new pet products since fall 2010. However, existing products which contain them can still be sold. For this reason, you should dispose of any flea products which you have containing carbaryl. Do not use them on your dog or any other pets. Never use flea treatments for cats on your dog or vice versa. Make sure you are purchasing the correct strength of dose for your dogs’ weight. Never try to simply use a smaller amount of a treatment which is designed for a larger animal, on a smaller animal. If your dog displays any of these symptoms, contact your vet right away. Fleas can be a nightmare for both you and your dog, but using the right flea shampoo is an easy and effective way to tackle this menace before it turns into a serious infestation. Here we have examined 5 of the best flea shampoos for dogs to help you bring your dog relief from their irritating bites. All of the above choices are effective at either killing or repelling fleas on your pooch. Of course, we have also made sure to reinforce how important it is to understand that no shampoo is suitable for all kinds of dog. Puppies, in particular, require more sensitive care in order to protect their health at this vulnerable stage in life. Before deciding upon a shampoo, always consult with your vet to ensure it will be the right match for your dog. Armed with the right flea shampoo, you can expect to eliminate those nasty bloodsucking pests for good!